Based on the 1960s horror film of the same name and featuring a score from the multi-award winning team of Alan Menken and Howard Ashman, the duo responsible for The Little Mermaid, Beauty and the Beast and Aladdin, the show is both a love letter and a glorious send up of the over-the-top plots of the B-movie genre. Down on his luck florist, Seymour, works for a domineering and cranky boss Mr Mushnik and is secretly in love with his co-worker, Audrey. Audrey pines for the idyllic family life in suburbia she sees in her Better Homes and Gardens magazines. Unable to find escape, Seymour and Audrey are resigned to their life of drudgery on Skid Row. Everything changes when Seymour stumbles upon a new breed of Venus flytrap during an unexplained total eclipse. Naming it Audrey II in honour of his love, Seymour soon discovers this is no ordinary plant. Audrey II can not only talk and move it can seemingly deliver everything Seymour has ever desired; fame, fortune and the love of one particular girl, Audrey. There is only one catch... the thing that gives Audrey II its power... Blood, At first Audrey II is content to take drops of blood from Seymour’s cut finger but soon its voracious appetite needs something bigger... and living. Featuring a host of eccentric characters from a Greek Chorus of Shoo-wop girls to a swarm of outlandish business people intent on exploiting to Seymour’s discovery and not forgetting Audrey’s dentist boyfriend, Orin Scrivello D.D.S., a character so outrageously over the top in his villainy that you’ll think twice before going for your next check up. Containing the show stopping numbers Skid Row, Feed Me, Suddenly, Seymour and the song you are bound to be singing to everything when you return to your garden Don’t Feed the Plants, Little Shop of Horrors is a rip-roaring evening of toe-tapping musical-comedy-horror entertainment sure to delight theatre goers of all ages. Little Shop of Horrors will be staged at the Braid Theatre, Ballymena, on Friday May 6 at 7.45pm. Tickets, priced £16, are on sale now from the Box Office or online at www.thebraid.com. 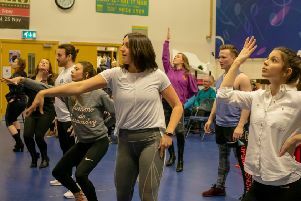 BSPA Ballymena meets at Cambridge House School each Saturday morning, with the aim of building the confidence of young people through musical theatre. Find out more at www.thebspa.co.uk.